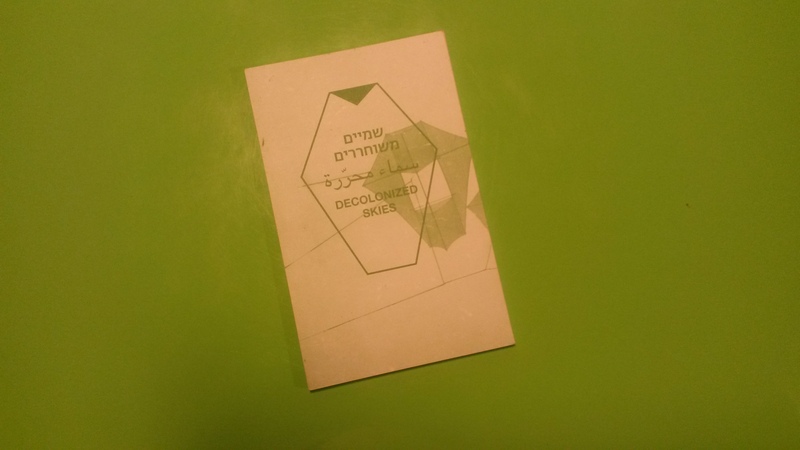 PublicLab:Jerusalem, (accompanied by myself:), have participated in the exhibition "Decolonized Skies" in Tel Aviv, that was curated by Yael Messer and Gilad Reich (High&Low Bureau) and was shown previously in New York and Barcelona. The exhibition is a result of a research conducted by Yael and Gilad, and it went through various changes in the different places in which it was presented. In New York it also included a balloon mapping workshop with the title "DIY Drones" conducted by Liz Barry. In Tel-Aviv Yael and Gilad wanted to feature Public Lab's work in Jerusalem and been putting the effort to give it significant space and attention in the exhibition. The whole space was designed by Hadas Zemer Ben Ari who did a great job. It has been a joy to work with each one of them, talking and thinking together, and besides all that it was a great opportunity for exposure. 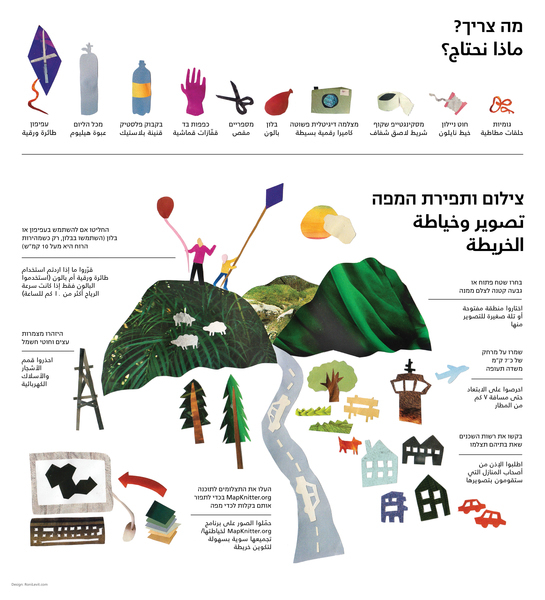 Designer Roni Levit created this lovely Hebrew-Arabic infographics for the Balloon and Kite Mapping kit. 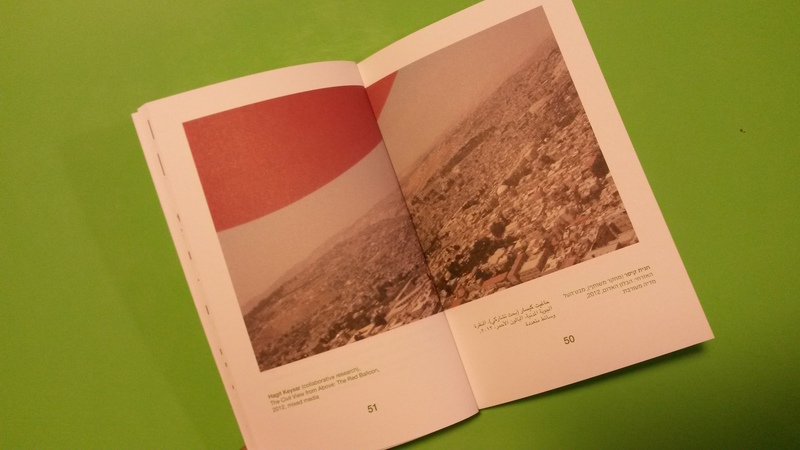 And there is also a small format catalog that features essays and and a generous description of each work in Hebrew, Arabic and English. If you are interested let me know and I can send you a copy! I hadn't seen images of this exhibition, and I must say the maps are beautifully presented. I'd love a copy of the booklet, too! 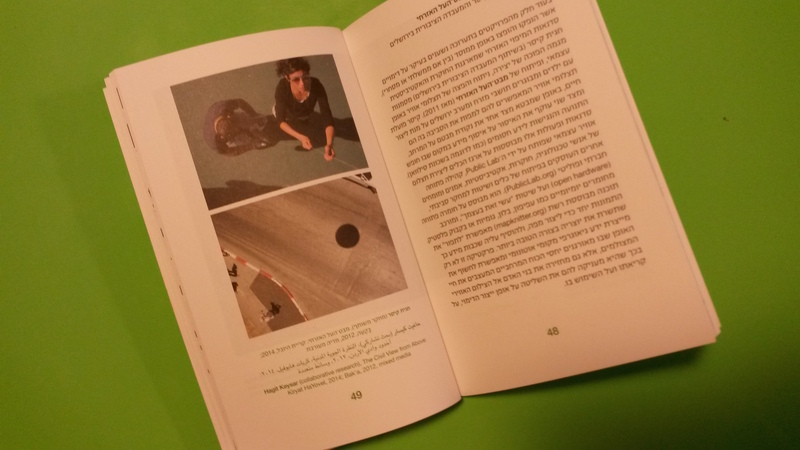 It's so sad to hear about the problems faced in the exhibition in Israel. Is it possible to access the Haaretz article in full without subscribing? “The view from above has become associated with state control and corporate power,” the curators, Yael Messer and Gilad Reich, write. “Since the invention of aerial photography during the last decades of the nineteenth century, the sky above our heads has become a territory subjected to militarized conflicts over mastery and command.” This view, which is the representative of absolute control, also kills: Most airborne attacks today in conflict regions are executed by UAVs (unmanned aerial vehicles). 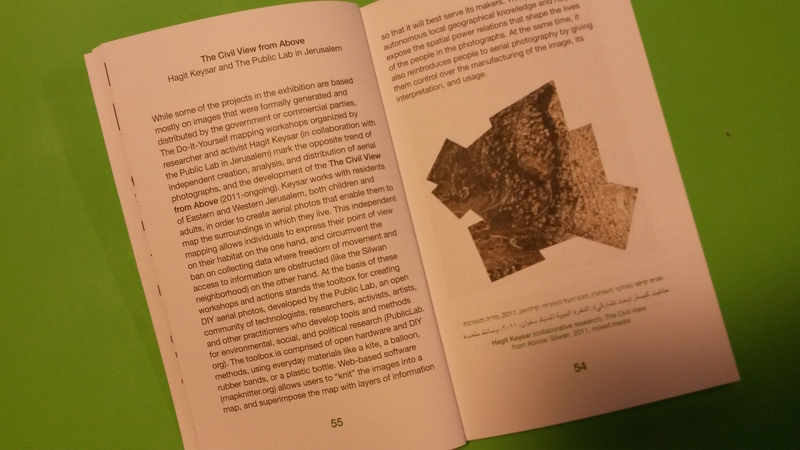 At the same time, in recent years the view from above is being subjected to a critical exploration of its political associations and its aesthetic potential, amid the growing routine civilian use of digital navigation and tracking systems (such as GPS and Google Earth). Kites used to support George R. Lawrence camera equipment, circa 1900-1910.George R. Lawrence “Parallel to this disturbing rising trend, and in many respects as a response to it, an increasing number of artists, activists, scientists and designers from different regions seek ways to use today’s technology to re-appropriate the sky and reclaim the view from above,” the curators note. A key point of departure in the exhibition’s structure is “San Francisco Earthquake Ruins,” photographed by the inventor and aviation researcher George R. Lawrence in 1906. The photograph has become iconic both because of its tremendous visual power – it’s a panoramic shot from an elevation of 2,000 feet (610 meters) showing a cloud-enveloped, sea-circled city, like a kind of lost Atlantis, and a disconnected, ruined continent that evokes an alien discovery in space – and because it represents a premodern civil view from above that provides practical information. Lawrence started out by taking pictures from ladders and towers. In 1901, he used what was effectively a cage tied to hot-air balloons, which became disconnected and fell. After surviving this incident, Lawrence developed an aerial photography technique in which he strung together a series of kites to hoist a camera that remained aloft for hours – the time then needed to produce a photograph. Two of these images, taken from what he called his “captive airship,” are on view in the exhibition together with the San Francisco shot. Panorama of the ruins of San Francisco, California after the earthquake in 1906. 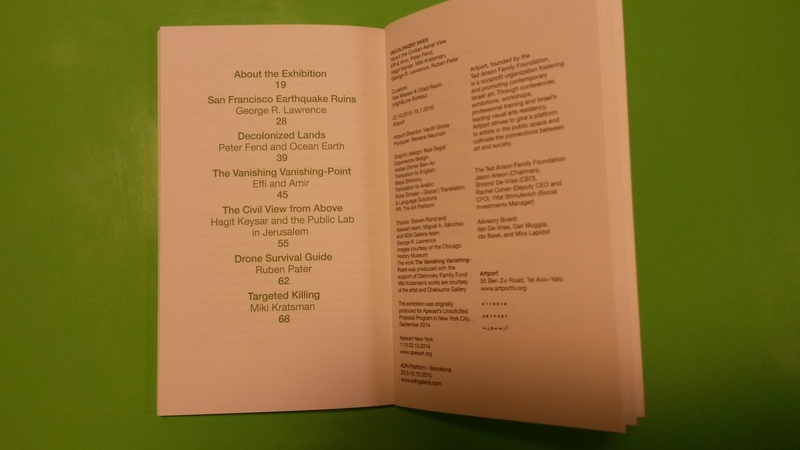 Photograph was taken by the George R. Lawrence Captive Airship.George R. Lawrence Most of the projects in the exhibition tend toward activism and information art. One of these, which dominates the center of the gallery, is by Hagit Keysar and the Public Lab in Jerusalem. The distinctiveness of this project is that it does not make use of images that were produced institutionally (by the government or commercially). Instead, it creates aerial shots in order to map life in areas where freedom of movement is restricted and access to information is blocked. Keysar conducts workshops and activities based on the photographic technique developed by the Public Lab, which involves aerial photography with the use of kites and balloons. The documented images are then fused together to produce a map. A large panel in the center of the project offers do-it-yourself tips for assembling a photograph from above, accompanied by infographics. Around this, on the floor, are maps created from dozens of photographs taken by residents in the East Jerusalem neighborhoods of Sheikh Jarrah and Beit Safafa, in “Vadi Ha’asbestonim” (valley of the asbestos structures) in the West Jerusalem neighborhood of Kiryat Hayovel; in Silwan, which abuts the Old City (where the map was created by children aged 10 to 12 in a workshop), and other locales, then brought together into a single serrated montage. Hi Hagit, This work is fantastic. I'm sorry to hear about how the current conflict affected the exhibit. if you're able, I would love to have a copy of the catalog. Argh, so sorry to read about the promotion issues. The exhibition looks great and everything is so well done. Keep on keepin' on. Thanks Klie, the promotion is not a big deal, anyhow it is one of those events that max 500 people know about... i think it was mostly the feeling that you're being silenced that was bothering us. This is fantastic! The wood mounted maps and the viewer assuming the balloon's-eye-view is really nicely done. The detail of the kids holding hands on the court is a very sweet break in tone within a very serious intervention. Hopefully the privacy afforded by censorship can be used as a space for planning the next even bigger and badder exhibit. I would love to see the booklet. Thanks Nick! bigger and badder sounds good :) pls email me you address I'll send the booklet to you.